Almost every winemaker's notes regarding the 2000 harvest of California Cabernets terms this vintage a "challenge." Given the pricing of the wines currently, the 2000 vintage is certainly a challenge to consumers, who are being asked to fork over significant sums of cash for the opportunity to drink these wines. The growing season featured a bit of rain at the start, apparently causing some reduction in crop levels due to a loss during flowering. A couple of really excessively hot days may have further impacted the crop level, with a heat spike in June. Overall, though, the summer months were rather mild. Late-ripening Cabernet Sauvignon vineyards were dependant upon crop levels a physical location. Many Cabernet vineyards in Napa were picked starting around the middle of September and some fruit was on the vine well into October. 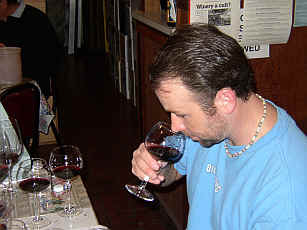 Some winemakers say the long "hang time" resulted in more intensity of fruit flavor. 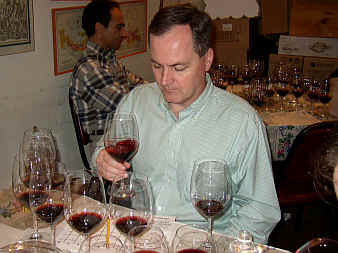 Others review the 2000 vintage as a "mixed" vintage of uneven quality. We find virtually every vintage to be "mixed" and quality is always "uneven." One wine was somewhat significantly ahead of the group. 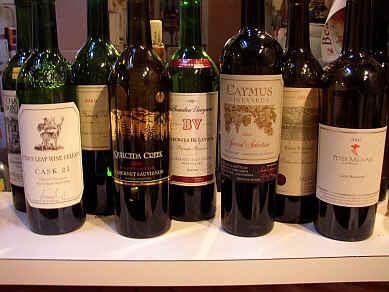 Three or four wines formed a group slightly behind the leader, with three others significantly behind that bunch, but not so far behind as to be viewed as significantly lagging in quality. My ratings of the wines has these bunched closely together. One taster noted a "weird" fragrance, reminiscent of a "cellar smell" and wondered if the wine had a slight corkiness to it. Other tasters didn't encounter that element. 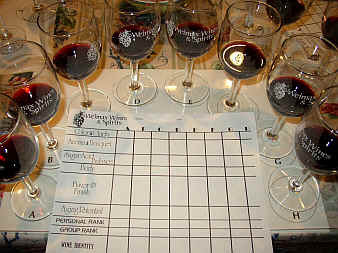 One person criticized the wine for having a "stemmy, green note and a short finish." Another taster found Montelena's wine to be "candyish and having notes of blueberry fruit." Someone else said "This is simple, coarse wine and it would be a good 'second label' Cabernet." (Parenthetically, Montelena does make a second label wine, formerly dubbed "Calistoga Cuve." This bottle was not the second label, but Montelena's flagship, estate wine.) Another person found "sour cherry fruit and tart acidity with balsamic notes and some rhubarb fruit on a dry, blunt finish." Someone else found "mint and eucalyptus note" which they liked, but they disliked the "pomegranate juice" element that gave this a sour quality. Final comments included someone finding the wine "too thin," while another person said it's "minty and has a great nose." 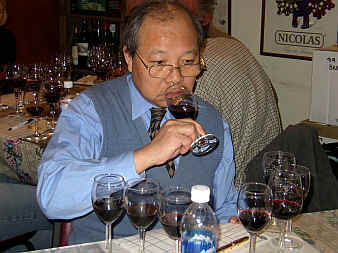 Gerald detected some "cassis-like fruit on the nose, along with berries and a plum note. I found some of the same fruit elements on the palate, with a touch of mint and dark fruit. There's a hint of an herbal note with perhaps a suggestion of a tobacco leaf quality here. It is certainly drinkable now and ought to evolve nicely over the next six to eight years. I gave it a one-and-a-half star ranking on my three star scale. No stars represents a standard quality wine." 7th Place: STAG'S LEAP WINE CELLARS 2000 Napa Valley "Estate-Cask 23"
"Dark and dense with licorice accents on blackberry fruit. This features some bramble and herb tones and finishes with a subtle fruit note." said one critic. Another taster found this to be "well balanced," while a third encountered "nice herbal fruit, leather and it's nicely varietal with good complexity." Someone else found Stag's Leap's wine to be "a little bit flat, with dark chocolate notes. It blossomed in the glass, though." Another tasted found a "grapefruit note on the nose, but it's weak in the middle." One critic described the nose as "backwards," noting it has a "bit of cherry fruit but it's bland." A final word from someone was "it's puckery in the mouth and there's some heat from the alcohol." Gerald was not enthralled by the nose of this wine, finding a "burnt wood character. This seems to hamper the fruit as there's a singed aspect to the oak. Later, there's an olive fragrance. The burnt wood notes on the palate are a bit odd and the oak seems disjointed in the wine. Might be worth a one star rating, but I'd like to re-taste this wine again." Described by one taster as "having green olive aromas, along with notes of herbs, lavender, sweet oak, cedar and tobacco, there's also a curious note of petroleum. I also got some jammy blackberry cobbler aromas and the wine is quite astringent." Another taster found it to have notes of "mushroom, green tea and it's unbalanced and one-dimensional." Someone else detected "upfront black raspberry extract, prunes, ganache and ripe blackberry fruit on the finish." One panel member found "green rhubarb-like notes on the nose and there are super sweet tones on the palate with notes of vanilla and cocoa." In agreement was another taster who found this to "be a sweetie...candy-like notes with cocoa and rich fruit cake qualities." Gerald found some "mild cassis fruit and berry notes at first, with a floral tone to the deep fruit aromas. Ultimately, it displays a slightly earthy quality and there's an herbal aspect to the nose. It's big, dark and fairly powerful on the palate, with lots of dark fruit flavors. Muscular and mildly minerally. Long cellaring may be warranted for this wine. One-and-a-half-stars." One person felt there was a 'musty' aspect to the nose of this wine. "It's earthy and displays a mushroomy scent with a note of band-aids and a medicinal taste. There's some black cherry on the palate, which I liked. But the funny nose of this wine caused me to rank it low." Another tasting participant found "stewed red fruits, dried brush with ripe fruit and a coffee and chocolate mint quality." One critic found "a rich, deep, loamy core of earthy currants and a smolderingly smoky fruit finish." A fourth taster characterized this as "heavy, full with big tannins. It's a blockbuster style of Cabernet, with overtones of hazelnut and cinnamon spice notes." 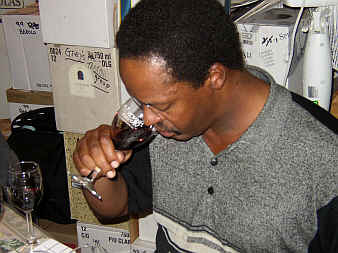 Gerald found a "sweetly oaked wine with red and black berry fruit notes. There's a nice, cedary, vanillin quality to this wine. Cocoa powder, too. 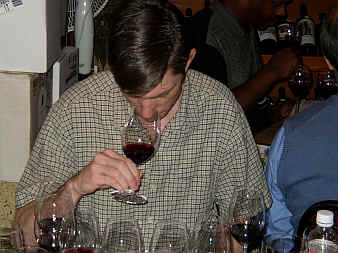 The grainy tannins contribute to the wine's mouth-drying aspects. Dark fruits. Big on the palate. Quite good. Two stars+. Needs time and patience." Here's a wine that enchanted a significant number of tasters, while repulsing a handful of others. One fan described it as "youthful and rambunctious, with ripe black plum fruit and nuances of bitter sweet chocolate. There's some graphite-tinged sweet vanillin oak accents on the finish." One critic did not appreciate what he termed the "Christmas spices" of this wine. He found notes reminiscent of "cinnamon and nutmeg, like a holiday eggnog. I found this distracting." A third person found "so much oak and only a little sweet cherry fruit. There's a slightly dirty aspect to this wine." Another critic found a lot of "complexity with spicy notes and a rich, almost gravelly character. It's broad on the palate with fine tannins on the finish." Someone else found a "tartness that runs throughout the wine. It has decent length and body, though." Gerald enjoyed the "woodsy, sort of lumberyard fragrances of this wine. There are some red fruit notes on the nose and an almost ginger spice character from the wood, as well. It's big, woodsy, minty and has deep fruit on the palate with some grippy tannins. Very fine. Two stars." Many people felt this wine had sweet aspect to it. One critic pronounced it "sweet," while another said the "fruit was riper than most of the other wines." Another felt it was "over ripe." A fourth person said it has "cooked rhubarb notes with baked cranberry fruit and a fat texture from its sweetness." Another panel member said it's "sweet, rich, powerful and has some spicy, ripened blackberry fruit, ample oak and fine polished tannins with a long, lingering finish." A sixth critic encountered "sweet currant fruit and it's mouth-coating with a sweet mocha finish." Another person found "blackberry and blueberry fruit notes and it's got a nice mouthfeel." Gerald liked the "sweet wood notes on the nose of this wine. It's got a cedary note and lots of dark fruit notes. It's a very charming and pretty wine, not relying on the wood for its foundation. It is certainly approachable now, but ought to be cellarworthy for another 8-12 years. Two stars." One critic liked this because of "its nice long finish and it's balanced and elegant." Another person found "ripe berry notes and a spicy, mocha nose, but the finish isn't so great." A third taster found "violets, blueberry and a fat, luscious texture with a great berry and cherry flavor." One panel member encountered "tart and earthy wild berry notes with tart blackberry fruit, some pencil lead tones and gamy meat with a tart finish." Someone else felt this was hindered by a "charred barrel character with really green tannins." A final critic mentioned it's "herbaceous." Gerald liked the "lovely fruit with a nice berry character. There's ample fruit and some nice, deep wood fragrances. I find an almost vanilla bean-like character, too. It blossoms nicely in the glass, too. On the palate there's a lot of lovely dark fruit with some black cherries leading the way, followed by a plum-like flavor. There's a nice bit of tannin and plenty of fruit to be balanced ten years down the road. Nice length on the palate, as well. Two stars." Placing somewhat significantly ahead of the pack, this wine fared well on 12 of the 16 scorecards. One taster felt it was "the most drinkable wine of the tasting." Another found "this to be full-bodied with orange, mint and India ink tones and it improved with airing. It's full and extremely astringent." Someone else sounded the "B" word, noting Brettanomyces here. 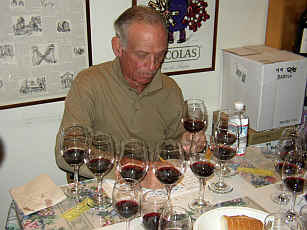 Bob said he downgraded the wine for having too much Brettanomyces. Ellen also marked it down for being a bit leathery. Another taster found "sweet and sour notes" in this wine. Someone else detected "minty notes with cedar and lead pencil...great balance...glycerine and sweet tannin and a lot of fruit. It's almost a bit chocolaty." A final voice said "it's intense and tightly wound, with smoky blackcurrants, pencil lead and some fresh-tilled earthy notes." 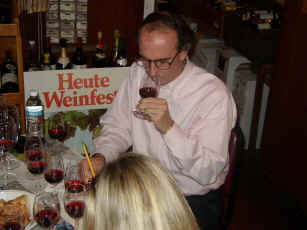 Gerald found deep, dark fruit with some pencil-shaving notes and nice blackcurrant fruit. The same elements come through on the palate, with medium to full body. It's moderately tannic, but stuffed with enough fruit to balance the tannins. Nice length, too. Probably needs five years to start to soften and may go as long as a dozen. Two stars+." 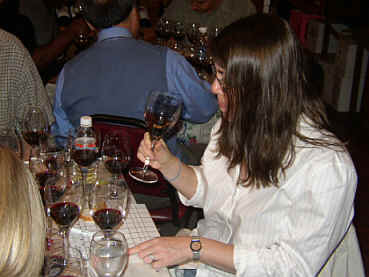 The photo below is what it would have looked like had Brennan Zerbe attended this tasting, after all.